The refugees who arrived at the U.S.-México border in November fled some of the most violent regions in the world; El Salvador, Guatemala, and Honduras. Televised testimonies and migrant accompaniment have reaffirmed the credibility of gang violence, police aggression and chronic poverty as factors that force people to flee Central America. However, what often goes overlooked is how US intervention and Honduran political authoritarianism created this humanitarian crisis. The historic wrong of US foreign policy is assuming that investing in Central American despotic armies and governments will ensure social development and preserve the rule of law. 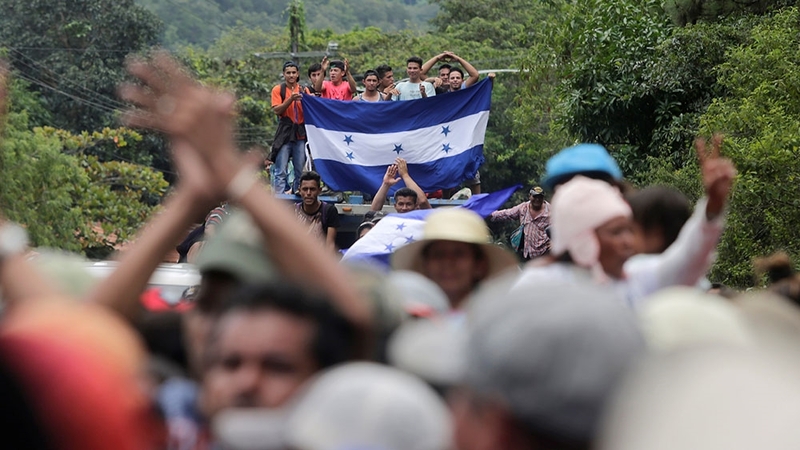 Thousands of Hondurans march towards the US either unaware of how much irreparable damage US foreign policy has caused their country or conscious enough to understand their asylum seeking as a reparation for the violence this regional approach continues to generate. For over a century, the US has bought shares in Honduras and used them to influence their national politics, economic direction and armed forces. Their stakes in the future of Honduras undermined their independence and converted it into a “banana republic:” a politically unstable country with an economy dependent upon the exportation of a limited source product. North American multinational corporations, with the backing of the US government, were able to overthrow a government in 1910. In 1954, the CIA and the US Secretary of State conceived and launched their plan to overthrow Guatemalan democratically-elected president Jacobo Arbenz on Honduran soil. During the 1980’s, president Ronald Reagan transformed Honduras into a military base of operations and experiments, converting Honduras into a safe haven and platform for Nicaraguan contra invasions. Most recently, the US Secretary of State Hillary Clinton supported a military coup that overthrew democratically-elected president Manuel Zelaya in June 2009. This has set the stage for the current autocratic, corrupt regime that for the past decade has overseen over 250,000 Hondurans flee Honduras. What is omitted from these very brief historical examples of US intervention in Honduras are the detailed violent repercussions that followed. Generations of Hondurans suffered oppressive labor conditions working for the United Fruit Company at the beginning of the 20th century, a transnational company whose business continuity was prioritized over the local populations well-being. After the 1954 Banana Workers General Strike and the humble victory they temporarily won, union leaders and left-leaning workers were violently targeted, and labor rights organizing was criminalized for decades to come. Peter Kornbluh in his book Nicaragua: The Price of Intervention, argued that in Honduras, “a steady increase in U.S. military aid reinforced the armed forces as the final arbiter of Honduras politics.” The millions of dollars the US poured into this military apparatus three decades ago contributed to the institutionalization of its impunity, considering their role in the recent coup d’etat, their appalling human rights record, and active participation in the regional drug trade. Contextualizing the history of intervention in Honduras improves our understanding of this migrant caravan as an exodus of refugees who are fleeing not misguided, but reckless policies of US imperialism. As a result, this modern banana republic represses working class, indigenous and rural Hondurans who peacefully demand a dignified living wage, respect for their ancestral and communal land titles, and end to governmental corruption. Trump’s administration is rallying anti-immigrant sentiment to galvanize support behind its congressional demands regarding the border’s physical infrastructure and the refugees that want to seek asylum. He’s threatened to cut off foreign aid to these Central American governments despite saying that the money “is probably just stolen” by corrupt leaders at a campaign rally in Georgia. This verbal claim does little justice to the actual web of corruption that’s prevented the Honduran state from achieving sustainable economic development, a functional democracy, and sound citizen security. In reality, the Honduran government declared a 10-day curfew, suspended constitutional rights, arrested over a 1,500 people, and murdered over 25 unarmed citizens, including a 19-year-old girl named Kimberly Fonseca. This is a recent example of the unfortunate, regional political tendencies that form the caravans we are seeing arrive at the border. If this has not been enough to seriously call into question this bilateral relationship, millions of Honduras hope the recent arrest of the Honduran president’s brother in Miami on charges of cocaine trafficking will provide an undeniable reason for this government to be held accountable. I visited Tijuana in December and had the opportunity to talk to some Hondurans about their reasons for seeking asylum in the United States. I had asked them if they heard about Tony Hernández’s arrest, and a Honduran man from El Progreso told me that many in the caravan received this very well. He admitted he still felt concerned, however, as to what would be the outcome and what impact it would have on their current status. Among the thousands of Hondurans detained in Tijuana, I came across some of the hundred of Haitians who began immigrating to this border state in 2016. They are not only refugees of the 2010 earthquake, but of US foreign policy as well, and many have been seeking asylum since the seventies and eighties. Like Honduras in the 1910’s, US marines invaded Haiti in 1915 and created the national army that would commit crimes against humanity with impunity. The foreign policy of this country under Ronald Reagan’s presidency intentionally denied political refugee status to thousands of Haitians while it eagerly upheld the Duvalier dictatorship. Blood thirsty military generals in Honduras and Haiti, trained and supported by the US, created a generation of refugees this country continues denying asylum to. The US has historically treated Central America as an industrial business park and counterinsurgency platform that violently instigated the Central American civil wars. US manufactured arms and capital flow easily across the same southern border whose enforcement is becoming more discriminatory and militarized towards those displaced by US geopolitics. While there is reluctance to let migrants in and give them due process, hypocritically, the US ardently upholds government leaders and military officials internationally denounced for their corruption and human right violations. Christopher Lopez is a member of School of the Americas Watch East Bay and Alianza Honduras NorCal.